Since 1953, one of the major highlights of the Cub Scout year includes the Pinewood Derby. Cub Scouts and their parents work together to design and create a vehicle out of a block of wood. Once the care is completed, the scouts race against each other. Now, it is your turn. Which team has the ability to create and race a car that will carry their team to the top of the leaderboards within their respective divisions? Who will then have the fastest car as the overall winner? Teams and individuals get a chance to race cars in the Kia showroom for all the bragging rights. This event will not be any fun without competition. Now is the time to challenge your friends and business competitors to race. They built cars and bragged about them in the past, demand they step up and prove their pinewood car design abilities again! Standard division rules apply, the same as in Scouting. 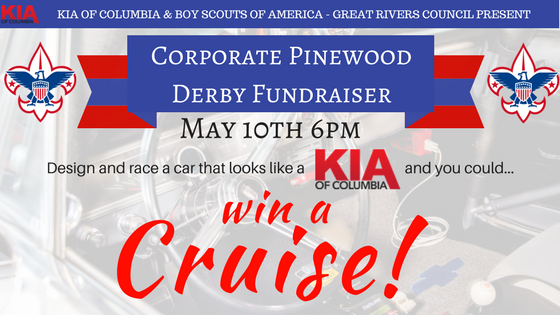 Special thanks to KIA of Columbia for hosting the Corporate Pinewood Derby. For more information and sponsorship opportunities, download this guide. Contact Greg Baker at 573-449-2561 x202 with questions.